Blend the tomato pulp, fresh coconut, chopped ginger and roasted cumin seeds. 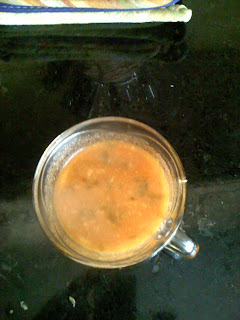 Put this mixure through a fine sieve so that the cumin seeds and coconuts shreds are removed from the blended mixture. Add salt and sugar to taste and mix well. I like it sweeter so I'd put about 1.5 spoons of sugar. This is the most time consuming part .. but u can keep this mixture ready before the party and the remaining part just takes 5 minutes. Basically add around 1/2 cup water and heat this mixture. Start the tadka (see the ingredients above) while this mixture comes to a boil.. Put tadka on the mixture and garnish with a coconut-coriander mixture.